New apartment, idyllic surroundings .Wi-Fi Unforgettable vacations! New apartment, one bedroom, 10 min walk from the beach. (max 4 people). Modern newly renovated apartment, consisting of a spacious and comfortable room with queen size bed, ceiling fan and built-in wardrobe (linen included). Full bathroom with bathtub, hair dryer (towel service). Living-dining room with sofa bed and table for four people, 32 "flat screen TV, free WIFI service throughout the apartment and ceiling fan. American kitchen fully equipped for four people (Vitroceramic, fridge, oven, dishwasher, microwave, washing machine and small appliances). Terraces with wonderful views. Pets are not accepted Located on a fifth floor with elevator to the fourth floor (not suitable for disabled), solariums, swimming pool overlooking the cliffs, the sports dock and the islands of La Gomera and La Palma. Spacious and comfortable hall with wifi service. A 5 minute walk, a marina to enjoy our favorite water sports, a beautiful natural pool and a beautiful black sand beach of volcanic origin, known as Gigantes beach or Los Guíos beach. You can practice a variety of sports such as fishing, diving, water skiing, sea kayaking, jet skis among others. Also, you can enjoy wonderful excursions on boats for dolphin and whale watching, as well as visiting nearby beaches. Ideal point of departure to the Teide National Park. For lovers of TREKKING, you can find the most spectacular trek in Tenerife, the Barranco de Masca. If your weakness is the Golf, only 15 km away is the ABAMA Golf & Spa resort. Very quiet place to rest, very well located, fantastic views, very bright and equipped with everything you need to spend a good holiday. A 5-minute walk, a marina to enjoy our favorite water sport, a beautiful natural pool and a beautiful beach of black sand volcanic beach known as the Giants or the Guios beach. They can practice a variety of sports such as fishing, diving, water skiing, be it kayaking, jet skis and more. They also enjoy wonderful boat trips for whale and dolphin watching, as well as visiting nearby beaches. ideal point of departure to the Teide National Park. For lovers of trekking, you will find the most spectacular walk of Tenerife, the Barranco de Masca. If your weakness is the Golf, just 15 km is the Abama Golf & Spa resort. Vi hade en härlig tid! Jose´s lägenhet var trevlig och allt fanns vad man behövde! Vi blev välkomna personligen med frukt o dricka! Vi var mycket nöjda och kommer gärna tillbaka! The apartment is perfect, well equipped kitchen, short walking distance to restaurants, shops and a tiny beach. - the swimming pool is on the first floor - just follow the foyer across from the elevator. The sunset is beautiful from there. - if you plan to use the bed in the living room, maybe ask Jose for extra bedding. We made it work but an extra blanket would have been nice. - don't forget to buy toilet paper! - the house number is actually 46-48 and just look for the guy hanging out by the entrance - he will be probably Jose and will give you the keys. We stayed at this property in the fall of 2018. The location is very good and very quiet while only 10-15 minutes away from grocery store and the harbour area (try the pool and restaurant there). In general most of the other reviews reflect positive aspects of the apartment and do not repeating. We did find that bedding supplied was a bit minimal for the time of year especially with several cool nights. Prior to arriving in Los Gigantes several emails to Jose were unanswered until we determined that it was best to write in Spanish using Google translate. Unlike many other places we have rented information on use of appliances, garbage disposal, etc was not provided but can be figured out in any case. Despite the minor issues we can recommend this apartment. Los Gigantes the town is very nice. 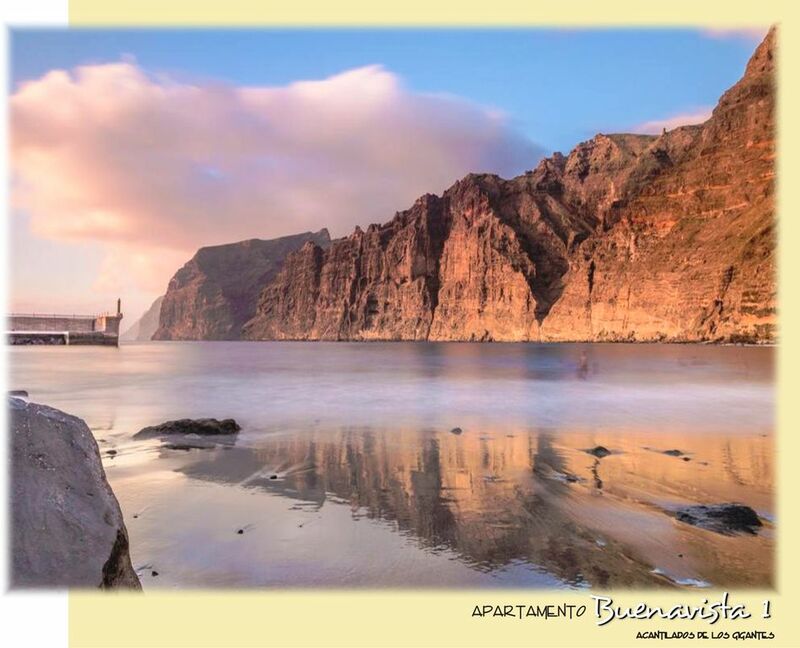 A lovely apartment with good views of the Los Gigantes cliffs. The apartment was perfect for two people with everything supplied that we needed. Jose was very kind in letting us stay there all day on the last day as we had a late flight home. However it should be pointed out there is no sun at all on the balcony certainly in October due to it's position in relation to the rest of the apartment block which shades it. This may or maybe not a disadvantage depending how hot it gets. Detailed instructions on how to get to the apartment which took a bit of finding especially in the dark are essential. Los Gigantes is perfect for both a family holiday or for couples as it is quieter than the bigger resorts along the coast but with everything there that you would need with the beach, boat trips, restaurants and bars playing live music. A 5 minute walk, a marina to enjoy our favorite water sports, a beautiful natural pool and a beautiful black sand beach of volcanic origin, known as Gigantes beach or Los Guíos beach. You can practice a variety of sports such as fishing, diving, water skiing, sea kayaking, jet skis among others. Also, you can enjoy wonderful excursions on boats for dolphin and whale watching, as well as visiting nearby beaches. Ideal point of departure to the Teide National Park. For lovers of TREKKING, you can find the most spectacular trek in Tenerife, the Barranco de Masca (www.mascalosgigantes.com). If your weakness is the Golf, only 15 km away is the ABAMA Golf & Spa resort (golf @ abamahotelresort.com).